The Funko Beauty and the Beast Mystery Minis figures replicate their live-action counterparts while adding more options than the Pop! Beauty and the Beast line. 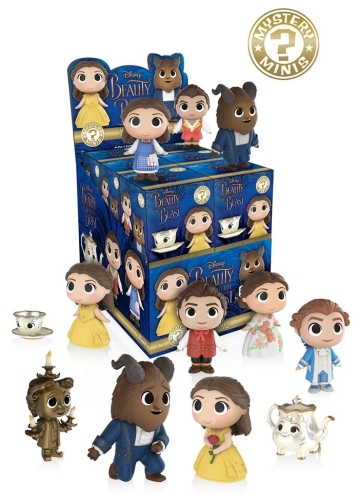 The set includes several versions of Belle along with the Beast. A timeless tale, Beauty and the Beast holds a special place in the hearts of kids and adults alike and the 2017 film continues that tradition. Fans and collectors can find many of the beloved characters, including Belle in her signature yellow dress, holding a rose, and another in a celebration gown. The Beast has two options, with one standing version and the other posed on bended knee. Buy Funko Beauty and the Beast Mystery Minis Boxes on Amazon. In addition, the Funko Beauty and the Beast Mystery Minis set features two figures for Gaston along with a single miniature of his sidekick, Le Fou. Rounding out the release are the enchanted castle's workers, including figures for Lumiere, Mrs. Potts and her son Chip. Standing approximately 2 1/2" tall, Funko Beauty and the Beast Mystery Minis stick to the standard formula, as each figure is issued in a blind-box format. In other words, every box is packaged to look and feel the same to keep the contents unknown until unwrapped. With 12 boxes per case along with exclusives issued through two separate retailers, completing the set will take a little extra work. Both Hot Topic and Walmart have three specific additional figures available in their cases. 2017 Funko Beauty and the Beast Mystery Minis figures for the main format and Hot Topic offer 1:12 individual odds. This means a full case should include every figure. We expect the Walmart set is the same but have not received official confirmation. Miniature figures for Belle are also found in 2016 Funko Disney Princesses Mystery Minis. All figures have 1:12 odds. The final three figures in each image lineup are exclusive to the format. Figures specific to a certain format are noted below. Buy Funko Beauty and the Beast Mystery Minis figures on eBay.